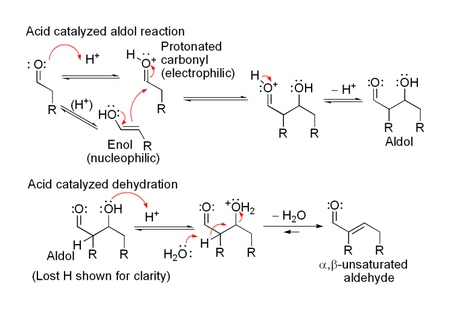 An aldol condensation is a condensation reaction in organic chemistry in which an enol or an enolate ion reacts with a carbonyl compound to form a β-hydroxyaldehyde or β-hydroxyketone (an aldol reaction), followed by dehydration to give a conjugated enone. Aldol condensations are important in organic synthesis, because they provide a good way to form carbon–carbon bonds. For example, the Robinson annulation reaction sequence features an aldol condensation; the Wieland–Miescher ketone product is an important starting material for many organic syntheses. 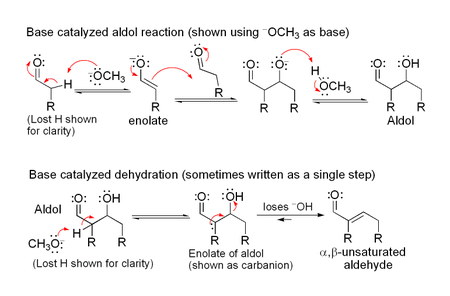 Aldol condensations are also commonly discussed in university level organic chemistry classes as a good bond-forming reaction that demonstrates important reaction mechanisms. In its usual form, it involves the nucleophilic addition of a ketone enolate to an aldehyde to form a β-hydroxy ketone, or "aldol" (aldehyde + alcohol), a structural unit found in many naturally occurring molecules and pharmaceuticals. The reaction between an aldehyde or ketone having an alpha-hydrogen with an aromatic carbonyl compound lacking an alpha hydrogen is called the Claisen–Schmidt condensation. This reaction is named after two of its pioneering investigators Rainer Ludwig Claisen and J. G. Schmidt, who independently published on this topic in 1880 and 1881. [page needed] An example is the synthesis of dibenzylideneacetone. Quantitative yields in Claisen–Schmidt reactions have been reported in the absence of solvent using sodium hydroxide as the base and plus benzaldehydes. Because the enolizeable nucleophilic carbonyl compound and the electrophilic carbonyl compound are two different chemicals, the Claisen–Schmidt reaction is an example of a crossed aldol process. The first part of this reaction is an aldol reaction, the second part a dehydration—an elimination reaction (Involves removal of a water molecule or an alcohol molecule). Dehydration may be accompanied by decarboxylation when an activated carboxyl group is present. The aldol addition product can be dehydrated via two mechanisms; a strong base like potassium t-butoxide, potassium hydroxide or sodium hydride in an enolate mechanism, or in an acid-catalyzed enol mechanism. Depending on the nature of the desired product, the aldol condensation may be carried out under two broad types of conditions: kinetic control or thermodynamic control. It is important to distinguish the aldol condensation from other addition reactions of carbonyl compounds. When the base is an amine and the active hydrogen compound is sufficiently activated the reaction is called a Knoevenagel condensation. In a Perkin reaction the aldehyde is aromatic and the enolate generated from an anhydride. A Claisen condensation involves two ester compounds. A Henry reaction involves an aldehyde and an aliphatic nitro compound. A Robinson annulation involves a α,β-unsaturated ketone and a carbonyl group, which first engage in a Michael reaction prior to the aldol condensation. In the Guerbet reaction, an aldehyde, formed in situ from an alcohol, self-condenses to the dimerized alcohol. In industry the Aldox process developed by Royal Dutch Shell and Exxon, converts propylene and syngas directly to 2-ethylhexanol via hydroformylation to butyraldehyde, aldol condensation to 2-ethylhexenal and finally hydrogenation. Ethyl 2-methylacetoacetate and campholenic aldehyde react in an Aldol condensation. The synthetic procedure is typical for this type of reaction. In the process, in addition to water, an equivalent of ethanol and carbon dioxide are lost in decarboxylation. Ethyl glyoxylate 2 and diethyl 2-methylglutaconate 1 react to isoprenetricarboxylic acid 3 (isoprene skeleton) with sodium ethoxide. This reaction product is very unstable with initial loss of carbon dioxide and followed by many secondary reactions. This is believed to be due to steric strain resulting from the methyl group and the carboxylic group in the cis-dienoid structure. In this reaction an alkynal 1 is converted into a cycloalkene 7 with a ruthenium catalyst and the actual condensation takes place with intermediate 3 through 5. Support for the reaction mechanism is based on isotope labeling. Due to epimerization through a common enolate ion (intermediate A) the reaction product has (R,R)-cis-configuration and not (R,S)-trans-configuration as in the starting material. Because it is only the cis isomer that precipitates from solution, this product is formed exclusively. ^ a b Carey, Francis A.; Sundberg, Richard J. (1993). Advanced Organic Chemistry Part B Reactions and Synthesis (3rd ed.). 233 Spring Street, NY: Plenum. p. 55. ISBN 0-306-43440-7. ^ Dzierba, C. D.; Zandi, K. S.; Moellers, T.; Shea, K. J. An Ascending Synthesis of Adrenalcorticosteroids. The Total Synthesis of (+)-Adrenosterone. J. Am. Chem. Soc. 1996, 118, 4711–4712. ^ Wade, L. G. (2005). Organic Chemistry (6th ed.). Upper Saddle River, NJ: Prentice Hall. pp. 1056–1066. ISBN 0-13-236731-9. ^ Smith, M. B.; March, J. (2001). Advanced Organic Chemistry (5th ed.). New York: Wiley Interscience. pp. 1218–1223. ISBN 0-471-58589-0. ^ Mahrwald, R. (2004). Modern Aldol Reactions. 1, 2. Weinheim, Germany: Wiley-VCH. pp. 1218–1223. ISBN 3-527-30714-1. ^ Heathcock, C. H. (1991). Additions to C-X π-Bonds, Part 2. Comprehensive Organic Synthesis. Selectivity, Strategy and Efficiency in Modern Organic Chemistry. 2. Oxford: Pergamon. pp. 133–179. ISBN 0-08-040593-2. ^ Mukaiyama T. (1982). "The Directed Aldol Reaction". Organic Reactions. 28: 203–331. doi:10.1002/0471264180.or028.03. ^ Paterson, I. (1988). "New Asymmetric Aldol Methodology Using Boron Enolates". Chemistry and Industry. London: Paterson Group. 12: 390–394. ^ Claisen, L.; Claparède, A. (1881). "Condensationen von Ketonen mit Aldehyden". Berichte der Deutschen Chemischen Gesellschaft. 14 (1): 2460–2468. doi:10.1002/cber.188101402192. ^ Schmidt, J. G. (1881). "Ueber die Einwirkung von Aceton auf Furfurol und auf Bittermandelöl in Gegenwart von Alkalilauge". Berichte der Deutschen Chemischen Gesellschaft. 14 (1): 1459–1461. doi:10.1002/cber.188101401306. ^ March, J. (1985). Advanced Organic Chemistry: Reactions, Mechanisms and Structure (3rd ed.). Wiley Interscience. ISBN 0-471-85472-7. ^ Nielsen, A. T.; Houlihan., W. J. (1968). "The Aldol Condensation". Organic Reactions. 16: 1–438. doi:10.1002/0471264180.or016.01. ^ "The Complete Mechanism of an Aldol Condensation". J. Org. Chem. PMID 27281298. ^ Carey, Francis A.; Sundberg, Richard J. (1993). Advanced Organic Chemistry Part A: Structure and Mechanisms (3rd ed.). 233 Spring Street, New York, N.Y.: Plenum. p. 458. ISBN 0-306-43440-7. ^ Seki, T.; Grunwaldt, J.-D.; Baiker, A. (2007). "Continuous catalytic "one-pot" multi-step synthesis of 2-ethylhexanal from crotonaldehyde". Chemical Communications. 2007 (34): 3562–3564. doi:10.1039/b710129e. ^ Badía, C.; Castro, J. M.; Linares-Palomino, P. J.; Salido, S.; Altarejos, J.; Nogueras, M.; Sánchez, A. (2004). "(E)-6-(2,2,3-Trimethyl-cyclopent-3-enyl)-hex-4-en-3-one" (pdf). Molbank. 2004 (1): M388. doi:10.3390/M388. ^ Ethyl 2-methylacetoacetate (2) is added to a stirred solution of sodium hydride in dioxane. Then campholenic aldehyde (1) is added and the mixture refluxed for 15 h. Then 2N hydrochloric acid is added and the mixture extracted with diethyl ether. The combined organic layers are washed with 2N hydrochloric acid, saturated sodium bicarbonate and brine. The organic phase is dried over anhydrous sodium sulfate and the solvent evaporated under reduced pressure to yield a residue that was purified by vacuum distillation to give 3 (58%). ^ Goren, M. B.; Sokoloski, E. A.; Fales, H. M. (2005). "2-Methyl-(1Z,3E)-butadiene-1,3,4-tricarboxylic Acid, "Isoprenetricarboxylic Acid"". Journal of Organic Chemistry. 70 (18): 7429–7431. doi:10.1021/jo0507892. PMID 16122270. ^ Varela, J. A.; Gonzalez-Rodriguez, C.; Rubin, S. G.; Castedo, L.; Saa, C. (2006). "Ru-Catalyzed Cyclization of Terminal Alkynals to Cycloalkenes". Journal of the American Chemical Society. 128 (30): 9576–9577. doi:10.1021/ja0610434. PMID 16866480. ^ The ruthenium catalyst, [CpRu(CH3CN)3]PF6, has a cyclopentadienyl ligand, three acetonitrile ligands and a phosphorus hexafluoride counterion; the acidic proton in the solvent (acetic acid) is replaced by deuterium for isotopic labeling. Reaction conditions: 90°C, 24 hrs. 80% chemical yield. The first step is formation of the Transition metal carbene complex 2. Acetic acid adds to this intermediate in a nucleophilic addition to form enolate 3 followed by aldol condensation to 5 at which stage a molecule of carbon monoxide is lost to 6. The final step is reductive elimination to form the cycloalkene. ^ Vashchenko, V.; Kutulya, L.; Krivoshey, A. (2007). "Simple and Effective Protocol for Claisen–Schmidt Condensation of Hindered Cyclic Ketones with Aromatic Aldehydes". Synthesis. 2007 (14): 2125–2134. doi:10.1055/s-2007-983746.